Yesterday, I published a post in which I noted that France had rebuilt promptly after one of the worst revolutions in recorded history: the French Revolution. Although history can hurt humans, humans can often work their way out of catastrophic circumstances. One cannot bring the dead back to life, but we can recover from the economic hardship caused by wars. 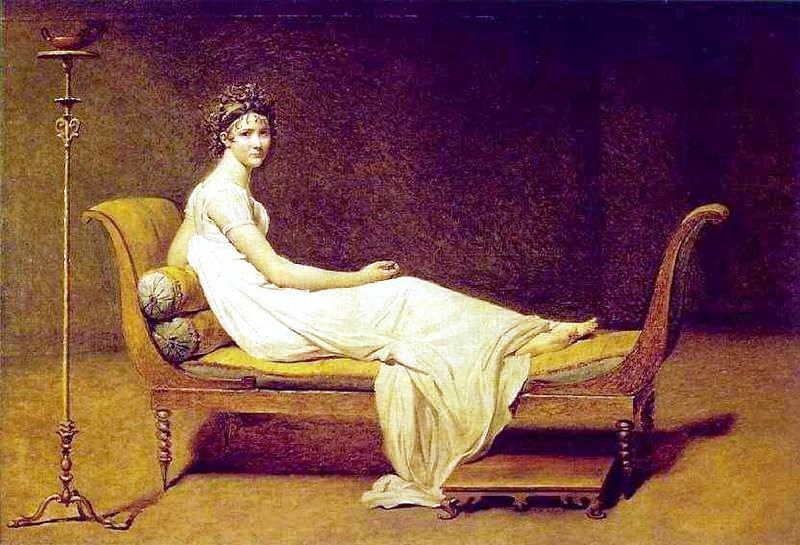 In 1800, Jacques-Louis David (30 August 1748 – 29 December 1825) produced his nearly iconic portrait of Madame Récamier. David was a neoclassicist, a movement that preceded the French Revolution, and painted his portrait of Madame Récamier a year after Napoléon (15 August 1769 – 5 May 1821) engineered a coup d’état that made him First Consul. 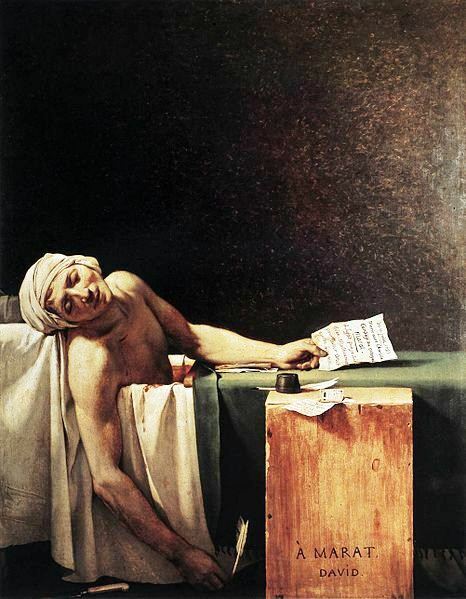 Yet, in 1793, David had made a portrait of Jean-Paul Marat (24 May 1743 – 13 July 1793) lying in his bathtub, stabbed to death by Charlotte Corday or Marie-Anne Charlotte de Corday d’Armont (27 July 1768 – 17 July 1793 [death by guillotine]). His tub was the only place Marat, a medical doctor, could find relief from the discomfort of a debilitating skin disease, probably dermatitis herpetiformis. Jacques-Louis David’s two portraits therefore attest to a form a resilience on the part of the French. France had not been bombed nor set ablaze, but it had to start anew and it did. Similarly, like the phoenix, the United States can rise from its own ashes. Two wars have left it panting… but no plan such as the Marshall Plan, the Federal Aid Highway Act of 1956, or TARP is being approved. I must therefore conclude that man-made impediments are getting in the way of recovery. The Marshall Plan was also an instance of resilience. In the space of four years, beginning in 1948, the United States succeeded in rebuilding Europe and Japan. The Marshall Plan went into operation three years after W. W. II, and that calamity befell Europe when the United States had only just begun to recover from the Crash of 1929 and the Great Depression. Moreover, a few years later, President Eisenhower was allowed the money he needed to build the interstate highway system. Construction was authorized by the Federal Aid Highway Act of 1956 and the cost of construction was estimated at $425 billion making it, as I read in Wikipedia, the “largest public works program since the Pyramids.” (Richard F. Weingroff [see Wikipedia]). That’s how we react. If one loses money and jobs are disappearing, one does not spend, yet spending is how we keep an economy functional. So the loss of jobs is a central issue, if not the central issue, not to mention that the government is cutting back benefits for the unemployed. The United States can and should provide the citizens of America with a comprehensive safety net. As the above pictures indicate, France, a chaos in 1794, had been put together again by the early years of the nineteenth-century. So let me repeat that one can rise again. a lack of respect for persons of colour. The current voter purge, or voter suppression points to prejudice. that people must have jobs and, if they do not have jobs, that jobs should be created. In this regard, President Obama has proposed a stimulus package that has been opposed. Why? a limit on the number of jobs than can be exported should be legislated. Yet, there is money, but among the rich and infuential, too many persons are paying to make sure that those who are elected into office next November will provide the rich with tax cuts. Moreover, while jobs are disappearing, CEOs, president of banks and insurance companies, the wizards of Wall Street and others continue to give themselves gargantuan bonuses. But, on the other hand, we had families who could no longer put bread on the table and individuals who stood to lose their life savings! Had compassion and justice gone out of fashion? Good citizens attend to the collective needs of their nation. The wealthy seem to think that because they are doing well, so is everyone else. That is individualism run amuck and fuelled by greed. [i]t is wrong – deadly wrong – to deny any of your fellow Americans the right to vote in this country. One’s ethnicity is like one’s rank in society. It is a mere accident of birth. We are all the same. Yet, it could be that ethnicity is related to the obstacles President Obama has faced from the day he was elected, the worst of which has been a tightening of the national purse when jobs need to be created and much fewer exported. Given that a man of colour was voted into the office of President of the United States, it could be people are washing their hands and arguing that the nation has proven that it does not discriminate on the basis of ethnicity. But as you know, President Obama has experienced such difficulties in his efforts to attend to the needs of his people as to make the results of the 2008 Presidential Elections look like a token gesture. Why was the stimulus package he proposed not adopted? The crash of 1929 could have been avoided. The Great Depression could have been avoided, World War II could have been avoided. It turned out that the United States could afford President Franklin Delano Roosevelt‘s New Deal. In short, after World War II, recovery was achieved despite the Crash of 1929 and the Great Depression. The Marshall Plan, implemented in 1948, proved a success. Later, in 1956, the Federal Aid Highway Act of 1956 made it possible for President Dwight David Eisenhower to build the interstate highway system. A wrong cannot correct a wrong, so not in a million years would I advocate punitive taxes, but people who have an income must pay their fair share of taxes and the amount of money levied from wealthy people should be higher than the amount of money paid by persons whose income is much lower. I am now closing this post.